After awhile her uncle wasn't walking beside her anymore, but behind her. He still had his right hand in a hard grip on her neck, and now his right hand curled around her shoulder and stroked her awkwardly. Luce didn't know what to think. Her uncle never touched her except to slap her. She didn't like the idea of killing anyone. But on the other hand, everything Catarina had said was obviously true. Humans did do terrible, unimaginable things, to one another and to the whole world. They'd done something awful to every girl here. This is a series that I wanted to start awhile ago, it sounded sad and yet beautiful. Sarah Porter seemed to have created something that would stand apart from the rest. 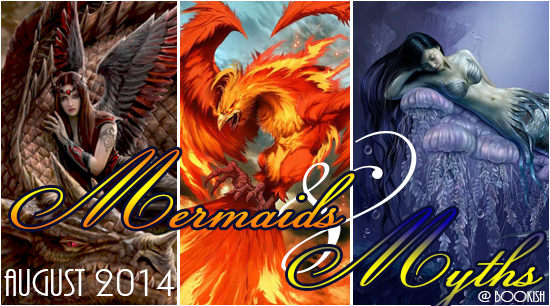 Often Mermaids have a magical, mythological or fantasy background. What sets this book in a category is that the background of how these being came to be. Sarah Porter took a brave step into something that could have gone either way but it seemed to ultimately work brilliantly. This is not your typical sunshine and singing for fun mermaids. These girls are killers, and kind of sit along the lines of a siren, because the only satisfaction that they get from this, is the humans deaths. The story behind how we have mermaids, is unique and yet is something tragic. The girls that are mermaids must have faced tragedy or abuse for a time long enough (different for each girl), to slip into the change. For some this is less and for some they must endure far more. This is something that is unique and saddening, but in a way it finds a beauty... a release from the pain. I also found that parts of the mythology/fantasy behind the girls was not just Mere but almost Siren. Mermaids are known for their voices, but the girls use this for leading boats/people to their death. People do this willingly and seem to die in bliss, but my question became why kill them. They have no use for their bodies or their property, so beyond possibly taking out future abusers, I was not sure what they accomplished in doing this. That being said, I found that the book had a bit of a slow start. We did get a lot of facts but there was no really plot beyond that I felt. As far as characters go Luce was easy and difficult to like. I chalk this up to the fact that she is young and has had horrible things happen to her. She is after all fourteen and will forever be so. However, I feel the need to also mention that she is mature for fourteen, and I will put that up to her upbringing. Luce has had love in her life but she has also had everything ripped away from her, and replaced with something no person should have to go through. Despite everything and the bitter seeds that the others tried to stroke, Luce had a pure heart. She wanted to embrace what and who she is now but she also wanted to do it in her own way, a way that is not conventional in any way considered normal. This was something that I could appreciate because she didn't just accept what she was told, and instead challenged what she was told. Seeing everyone in the book is female, no males at all, there is a lot of female cattiness going on. Sometimes the older mermaids were a little more mature but honestly once Anais came along, it was like Mean Girls Mermaid style. I can't even tell you how bad I wanted to punch this self centred evil thing. I don't believe she is good for anything beyond evoking rage and knowledge that people can be that self centred. Catarina was a flip vote at any time. She wasn't cold all of the time but she could be. I will not deny that I understand where she stood, and where she was coming from but I wished that she wasn't so easily manipulated. There were other girls that I did love, and others that melted into the background, and out of my mind. Each I can still picture but some just seemed unimportant to me. Having the second book sitting and waiting to be picked up, makes the finish of this book easier. There was action but for the most part I really feel that this book set up for the rest of the series. I stand by the fact that Sarah Porter has created something beautiful and yet haunting at times, and her writing brings everything to life. The scenery and people were clear as day and easy to see. I think that people that are fans of mermaids will have no problem picking up this book, and if you want to try them know that this book steps outside of the norm for Mer reads and is almost in a category of its own.